Grab your sparkly shoes and cute outfits, ladies! It's time to ring in the New Year the right way... surrounded by the people you love. I'm really looking forward to spending New Year's Eve with the love of my life and our friends celebrating how wonderful 2011 was. I have a feeling that 2012 is going to be a very magical year, and I can't wait to see what comes my way! "She had a cocktail in hand and confetti in her hair." Alrighty shopaholics... I need your help! Adam and I are going to our good friends' wedding next weekend. I was going to recycle my black sheath dress that I got on sale last year from BCGB, but due to Adam being in the wedding... I need a dress for the rehearsal dinner too! Now let me tell you, due to the hundreds of weddings we attended last year... I have plenty of bright, floral patterned dresses. But none of them will work for a winter wedding in freezing January. Needless to say, I've been on a sale hunt. If I can find one at a decent price, I may wear the black dress to the rehearsal dinner and the new one to dance the night away in! But I need major help! LOVE this eggplant color Max & Cleo one-shoulder dress, but $158? Obviously, I would dress an options up with awesome jewelry, black tights and my chunky black booties that I love! But I am not completely sold on any of these options... anyone have any suggestions on where to shop cocktail dresses?! Plastered across magazine headlines, endorsing products, and on TV. Successful slim downs of real people who look and feel really good! I can't help but be inspired by the likes of Jennifer Hudson and Kelly Osborne! They look so awesome and healthy, and they sure as heck didn't get there by sitting around and eating Christmas cookies! Lucy Novelty Propel Knee Pant - on sale $39! So there you have it... my shopping list! One thing I've learned is to not wait until you've reached your goal weight to buy workout clothes - you've got to feel cute and comfortable NOW while you're on your way there! I'm starting 30 Day Shred tonight for the first time, and I'm really nervous/excited! I may have to place my Bondi Band order super soon. Adam and I have decided to make running dates for Saturdays/Sundays to help us get ready for our half marathon. I'm going to need something to keep my long hair out of my face. Has anyone tried these? I need a recommendation! Know of any great workout shopping? Help a sister out! With a big snow storm rolling into Kansas City tonight and Wichita tomorrow, we may have a very beautiful white Christmas no matter where I'll be! My little sister and one of her best friends are heading up to KC today to come spend time with metoday, and I'm sooo excited to see them! They're going to shop til they drop, then we're going to a Christmas party before they head out tomorrow morning to beat the snow storm. Anyway, enough about me, shall we get this party started? 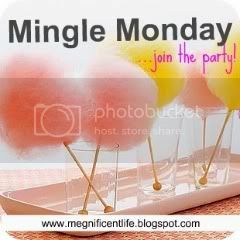 This will be the last Mingle Monday of 2011, and we will start up again in 2012! ...so let's go out with a BANG! ...which means it's date night with my hunky man friend (he would chuckle and shake his head at me if/when he reads this)! So he text me a little while ago and said he has something planned out... isn't that adorable? I sure thought so. BF is planning for us to pile in his mini cooper, stop by Starbucks to get peppermint cocoas, and then go holly jollying around town! What seasonal must-do's are on your holiday list? You can't miss this awesome giveaway! Miss Laura, author of The Luckiest in Love blog, is offering a $20 credit from her Thoughtfully Designed Etsy shop. on what you would use your $20 credit to buy. + Add Thoughtfully Designed as a favorite on Etsy. Winner of the $20 Thoughtfully Designed Etsy credit will be announced this Friday morning! A big thanks, once again, to Laura for offering her beautiful talents! Excited to see who wins! PS - In case you missed the Mingle Monday blog hop yesterday, go check it out (open until Friday)! Get your blog some exposure and find some other great blogs! My oh my, how's everyone doing today? Luckily KC just got a light dusting, but it made my work commute about 90 minutes... gee whiz! Good thing I had my Christmas music to keep me company, eh? Now if only I had these things to help me out... I mean how cool would it be to have a gift wrap ROOM!? What holiday wrapping trends are you loving? 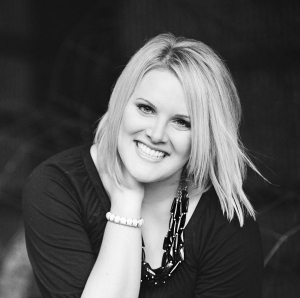 PS - In case you missed the Mingle Monday blog hop yesterday, go check it out! Get your blog some exposure and find some other great blogs!